His name is Melvin and he has been adopted!! HE'S JUST A BABY, ONLY 5 MONTHS OLD. HE DESERVES TO KNOW WHAT LOVE IS! WHO AM I? I don't know my name yet. The shelter staff think I am about 5 months old. I have been here since Nov 15, 2011. I know I had a home, but I don't remember where it is. Will you take me home? I could be a brave boy and help protect you and keep you safe and show you lots of love. Please take me home, please. 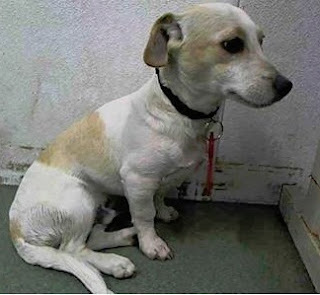 DOG - ID#A510825 (should be available 11/20) I am a male, white and tan Chihuahua - Smooth Coated mix.